At Ruff Haus we treat our pets like part of the team. That's partly because research shows that pets in the workplace can help boost morale, increase productivity, relieve stress and even provide a means for co-workers to connect and bond with one another. And partly because we couldn't imagine having it any other way! Whether you spend your weekdays in a large corner office inside a high-rise building downtown, a retail store or an open studio setting like us, there are many perks to bringing your beloved pet to work. Though most of this article is specific to dogs - for obvious reasons - the etiquette is adaptable to animals and work environments of all kinds. Having your little friend with you during the day not only gives you a good excuse to take a short break from the grind every once in a while, but it also keeps your animal happy and feeling loved. The 5 categories listed below serve as both suggestions and things to keep in mind when considering a companion in the workplace. We also suggest you check with your company regarding their policy on pets to see if there are any specific do's and don'ts. Provide your four-legged friend with his own space in order to get away from hubbub, feel comfortable and avoid territorial tendencies. Set up the area beforehand and show him where to stay. Consider a small crate, pet bed, blanket or pillow under your desk to keep your pet close and content. You should also hang a sign on the door to inform unsuspecting visitors of the animal's presence. If you must spend time away from your personal workspace, get a leash or baby gate to discourage him from roaming around and causing trouble. Of course, you'll need to provide a small amount of fresh water and keep all pathways and walkways clear of toys and bones. You may even have to remove or pet-proof any potentially hazardous items, including trash cans, loose wires, pencils and the like. Supervision is essential to keeping everyone in the workplace convivial, so be aware at all times. If your pet has behavioral issues, bringing him to work may not be good for either of you - the last thing your co-workers and supervisors want is to hear constant yapping and whining when they're trying to conduct business. Remember that not everybody loves your pet as much as you, and some people even have serious fears and/or allergies, so be courteous and mindful. Even if someone is annoyed with your pet's behavior, they may not know how to bring it up, so take corrective action before problems arise. Talking with co-workers ahead of time about the idiosyncrasies of their pets, as well as your own, will help everyone get on the same page. Be sure to ask the owner before petting or introducing two unfamiliar animals to one another. Allow others to take a sniff around and get acquainted to reduce the risk of problems down the line, or hallway so to speak. Your pet must be clean and up to date on all required shots and vaccinations before even considering a day at the office together. It is better to leave the animal at home if it is experiencing lethargy or if you suspect any illness or discomfort. Hygiene is just as important as health – you don't want mud, hair or dander being scattered around the workplace, and it's safe to assume that others don't want those things either. Also, sick pets can often be defensive and the last thing you need is a growling pet around the office – you probably get enough of that from your boss. This probably goes without saying, but don't bring in a pet if he is not potty trained. Also, keep pet stain remover spray and poop pick-up bags handy just in case of an accident. Even small accidents can cause some disharmony – not to mention foul odor – in the workplace, especially if someone else has to clean up after your pet, so be aware of the time and go outside as often as necessary to avoid a messy accident. A quiet toy or two to keep your pet busy when your attention is elsewhere. Take breaks often and go outside to throw the ball or hand out treats. 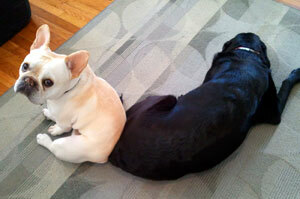 For a real tail waggin' good time, try scheduling visits and group walks to get co-workers involved. Lunch breaks in the park are perfect for midday play time with all members of the pack. Also, consider a short walk before going into the office to eliminate any extra, unexpended energy. The items listed above are meant to provide you, your pet, your co-workers and their pets the best possible experience on a day-to-day basis. Being around people and other animals regularly provides great social experience for your pet, and you won't have to feel guilty about leaving the little fluff ball behind every morning. To help ease into the new routine, you may want to begin with half days. Moreover, freshen up on common commands such as sit and stay before exposing the animal to a full day at the office. As soon as everyone gets comfortable, imagine all the extra hours you could spend at work once you don't have to rush home to let Steve the Schnauzer outside to take care of his own business.